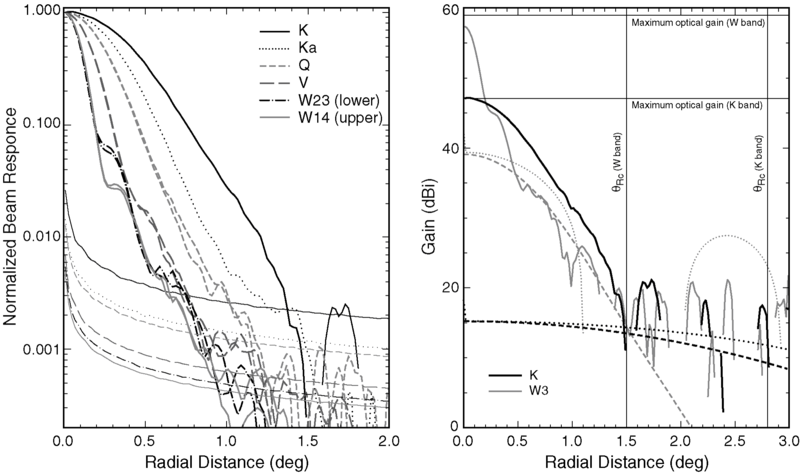 WMAP First-year Paper Figures, Page, et al. Jupiter maps of the A and B side focal planes (Bennett et al. 2003c) in the reference frame of the observatory. The contour levels are at 0.9, 0.6, 0.3, 0.09, 0.06, 0.03 of the peak value. W1 and W4 are the “upper” W-band radiometers. In W band, the lobes at the 0.09 contour level (≈ -10 dB) and lower are due to surface deformations. Left: The symmetrized beams (normalized at unity) and noise levels (below) from two seasons of Jupiter observations. Both polarizations have been combined. The noise rises at small radii because there are fewer pixels over which to average. With four years of observations, the noise level will be reduced by a factor of two. 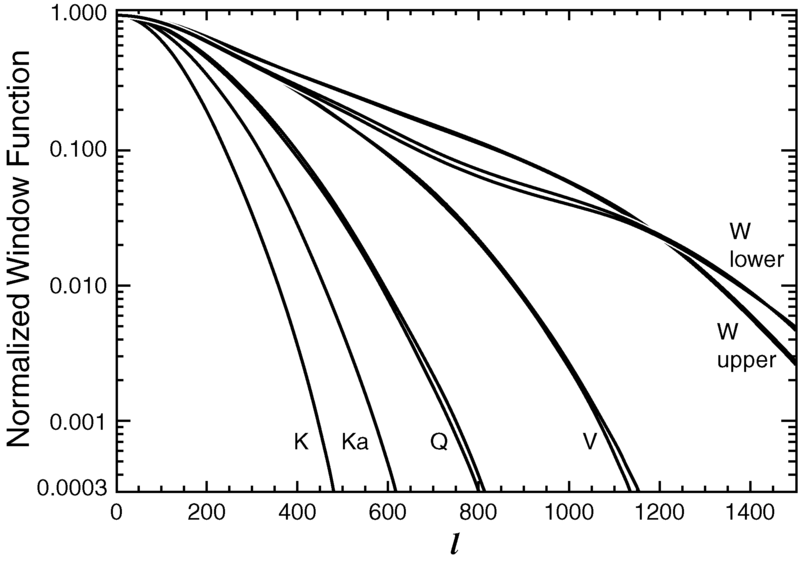 Right: The K (black) and W3 (grey) symmetrized beam profiles with their associated Ruze patterns (§2.1). The noise level is at 20 dBi in all bands as seen in the plot (missing data corresponds to negative values). The maximum optical gains are 47.1 and 59.3 dBi in K and W bands as indicated by the horizontal lines. The dashed lines are the Ruze patterns assuming a Gaussian shaped distortion with the parameters in the text. The lighter shaded dotted lines that meet the dashed lines at θ = 0 are for a tophat shaped distortion. Left: A mosaic of the A-side W and V-band measured beams. One should focus on the main beams areas. Different noise levels in the constituent mosaics lead to apparent artifacts away from the beam centers. Right: Model of the A-side beams based on the physical optics calculations described in the text. The same surface is used for all beams. Most of the features in the measured beams are reproduced in the model indicating that the source of the distortions has been identified. The noise from the measurement has been added to model on the right to make the comparison more direct. The separation between different W-band beams is 1.1°, less than the cutoff radius for the determining the W-band solid angles. The ten window functions, wl , computed from the Hermite expansion. The window functions for the two polarizations in each feed are nearly indistinguishable at the resolution of the plot. 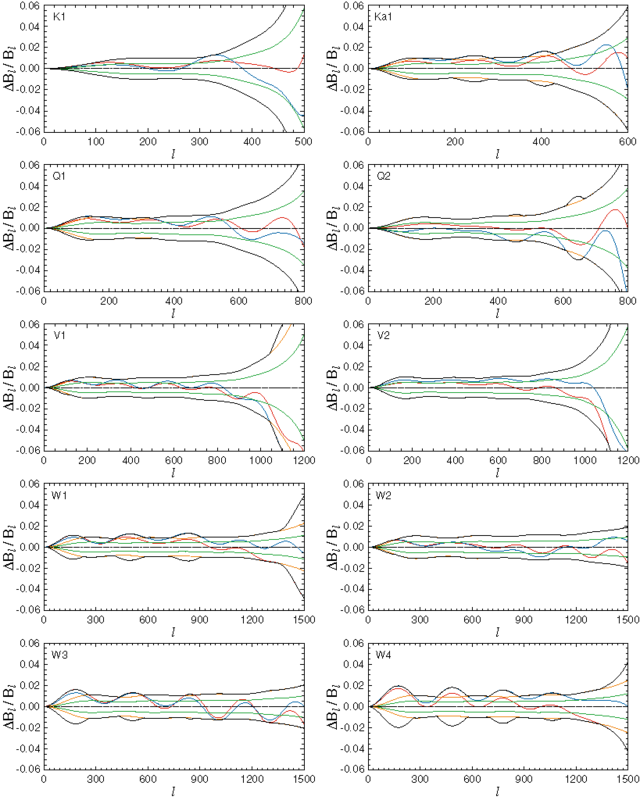 The transfer functions and their statistical and systematic uncertainty. The y axis of each panel shows the fractional uncertainty. The green curve is the statistical uncertainty in the Hermite-based transfer function. The orange curve corresponds to twice the statistical uncertainty (it is mostly hidden by the black curve). The red curve is the fractional difference between the bl computed from the spherical harmonic decomposition of the time stream and the Hermite fit. The blue line is the fractional difference between the bl derived from the Jupiter maps, after dividing by the 2.4' pixelization window function, and the Hermitebased transfer function. 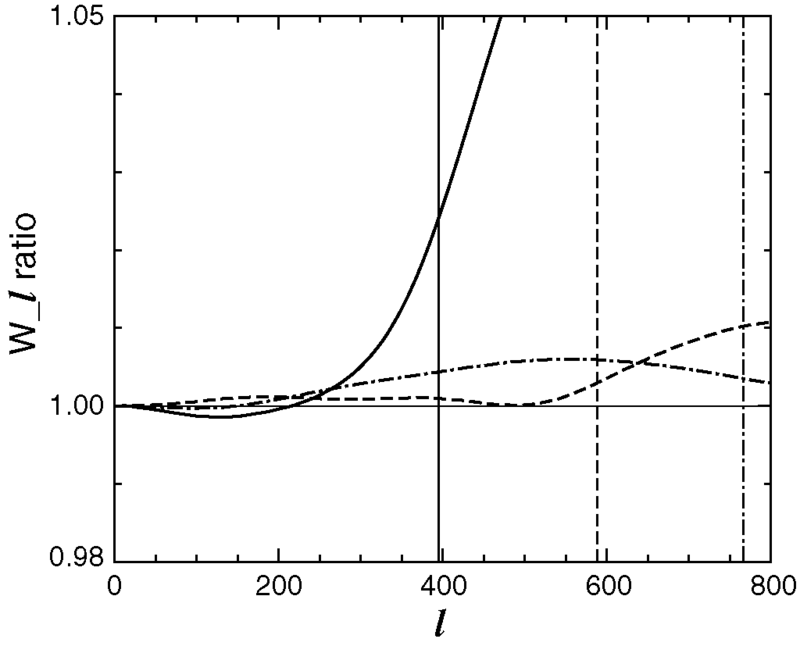 The black curve is the adopted 1σ uncertainty used in all analyses. It corresponds to the absolute value of the maximum deviation from zero of the red, blue, and orange curves. The uncertainties on the window function, wl , are twice these, but average down when multiple channels are combined. A comparison of the window function of a fully symmetrized beam (characteristic of pixels near the ecliptic poles), to the window function of a beam with only partial symmetrization (characteristic of pixels near the ecliptic equator). The solid line is for Q band, the dash line is for V band, and the dot-dashed line is for Wband. The vertical lines indicate where the window functions drop to 0.1 of their value at l = 0.